Boris Belkin a commencé à étudier le violon à l’âge de 6 ans, faisant ses premières apparitions publiques à 7 ans avec K. Kondrashin. Il commence par étudier au Central Music School du Conservatoire de Moscou avec comme professeurs Yankelevitz, Glezarova et Andrievsky. Alors qu’il est encore étudiant, il donne des concerts dans toute l’Union Soviétique avec les principaux orchestres. En 1973, il gagne le 1er Prix du Concours National Soviétique pour violon. En 1974, Boris Belkin émigre à l’Ouest. Depuis cette époque, il donne de nombreux concerts dans le monde avec des orchestres aussi importants que le Boston Symphony Orchestra, Cleveland Orchestra, le Berlin Philharmonic, Israël Philharmonic, Los Angeles Philharmonic, les orchestres de Philadelphia, Detroit, Pittsburgh, Montréal, Bayerischer Rundfunk, Concertgebouw, l’Orchestre National de France et tous les orchestres anglais. Boris Belkin a participé à de nombreux films télévisés dont un grand film sur la vie de Sibelius en interprétant le concerto de Sibelius avec l’Orchestre de la Radio Suédoise sous la direction d’Ashkenazy. Lors d’autres productions télévisées, il a également enregistré avec Leonard Bernstein et le New York Philharmonic Orchestra (concerto de Tchaikovsky), avec l’Orchestre National de France et Leonard Bernstein (Tzigane de Ravel) ainsi qu’avec le Concertgebouw d’Amsterdam et Bernard Haitink (Mozart et Paganini n°1). Tous ses concerts sont placés sous la direction de chefs aussi prestigieux que L. Bernstein, V. Ashkenazy, Z. Mehta, L. Maazel, R. Muti, S. Ozawa, K. Sanderling, Y. Temirkanov, Dohnanyi, C. Dutoit , Gelmetti, G. Herbig, K. Tennstedt, S. Rattle, B. Haitink, P. Berglund, Mata, M. W. Chung, J. Hirokami, F. Welser-Most. Boris Belkin a beaucoup enregistré pour Decca et a notamment reçu de nombreuses très bonnes critiques pour son premier enregistrement du 1er concerto de Paganini avec l’Israël Philharmonic Orchestra et Zubin Mehta. Depuis, il a enregistré les concertos de Tchaïkovski et Sibelius avec Vladimir Ashkenazy et le London Philharmonia ainsi que les concertos 1 et 2 de Prokofiev avec le London Philharmonic Orchestra et Kiril Kondrashin ; le concerto de Strauss avec le Berlin Radio Orchestra et V. Ashkenazy ainsi que le concerto de Brahms avec le London Symphony Orchestra et Ivan Fischer. Pour Denon, il enregistre les deux concertos de Prokofiev avec l’Orchestre de la Tonhalle de Zürich sous la direction de Michaël Stern ; les concertos de Sibelius et Bruch, ainsi que ceux de Chostakovitch et Glazounov avec le Royal Philharmonic Orchestra et J. Hirokami, le concerto de Tchaikovski avec le London Philharmonic Orchestra et Michaël Stern. Enfin, Boris Belkin a enregistré le concerto de Mozart KV 219 et la Symphonie Concertante avec le Salzburg Chamber Soloists, et des sonates pour piano et violon de Brahms avec Michel Dalberto. En 1997, Isaac Stern a invité Boris Belkin à jouer avec lui au Miyazaki Festival. Boris Belkin a joué à Moscou dans le cadre du 1er festival organisé par Mstislav Rostropovich avec le Saint Petersburg Philharmonic Orchestra en 2011. Durant la prochaine saison, Boris Belkin fera une tournée avec le Saint Petersburg Philharmonic sous la direction de Y. Temirkanov en Hollande, Autriche et Allemagne. Il tournera également au Japon, en Amérique du Sud, en Espagne avec l’Orchestre Philharmonique de Moscou. Chaque été, Boris Belkin donne des masterclasses à Sienne en Italie, à la très réputée Académie Chigiana. Boris Belkin began studying the violin at the age of six and made his first public appearance when he was seven with the great conductor Kyrill Kondrashin. He studied first at the Central Music School of the Moscow Conservatory with Professors Yankeievitz, Glezarova and Andrievsky, very quickly playing as a soloist all over the Soviet Union with its leading national orchestras whilst he was a student, and in 1973 won first prize in the Soviet Union’s National Competition for Violinists. Boris Belkin played in Moscow at the inaugural 1st Rostropovich Festival in 2011 there with Temirkanov and the St Petersburg Philharmonic orchestra. He emigrated to the west in 1974 and since regularly worked with conductors like Bernstein, Ashkenazy, Mehta, Maazel, Muti, Ozawa, Kurt Sanderling, Temirkanov, Dohnányi, Dutoit, Gelmetti, Herbig, Tennstedt, Rattle, Haitink, Berglund, Mata, Chung, Hirokami, Fedoseyev, Ahronovitch, Welser-Most, Lazalev, Simonov, Gelmetti and Kogan, alongside many others, performing with the world’s leading orchestras including the Boston Symphony, Cleveland, Berlin Philharmonic, Israel Philharmonic, Los Angeles Philharmonic, Philadelphia, Pittsburgh Symphony, Montreal Symphony, Bayerischer Rundfunk, Royal Concertgebouw and the major British Orchestras. Boris Belkin has regularly returned to the Miyazaki Festival since he was first asked by Isaac Stern to perform with him at it in 1997 and he plays chamber music with artists such as Yuri Bashmet, Mischa Maisky, Georges Pludermacher, and many others. Season ‘12/13 includes several concerts in Paris, Moscow and Spain with the St. Petersburg Philharmonic and Yuri Temirkanov, and tours to South America and Spain with the Moscow Philharmonic. Boris Belkin has featured in several television productions which include a film on Jean Sibelius (performing the Concerto with the Swedish Radio Orchestra and Vladimir Ashkenazy), with Leonard Bernstein and the New York Philharmonic playing the Tchaikovsky Concerto, with Bernstein and the Orchestra National de France playing Ravel's Tzigane and with Bernard Haitink and the Royal Concertgebouw Orchestra in Mozart and Paganini’s Concerto No.1. Boris Belkin’s first recording, Paganini’s 1st Violin Concerto, was with the Israel Philharmonic and Zubin Mehta and was extremely highly praised. His other discs for Decca include the Tchaikovsky and Sibelius Concertos with The Philharmonia and Ashkenazy, Richard Strauss’s Concerto with Berlin Radio and Ashkenazy, Prokofiev’s Concertos No.1 and No.2 with the London Philharmonic under Kondrashin and Barshai and the Brahms Concerto with the LSO and Fischer. For Denon he has recorded the Prokofiev Concertos with the Zurich Tonhalle and Michael Stern, the concertos by Sibelius, Bruch and Glazunov plus Shostakovich’s 1st Concerto with the Royal Philharmonic and Junichi Hirokami, Tchaikovsky’s Concerto with the London Philharmonic conducted by Michael Stern, Mozart’s Concerto in A major K219 and Sinfonia Concertante with the Salzburg Chamber Soloists and Brahms’ Sonatas with Michel Dalberto. Boris Belkin has held master classes in Siena, Italy, at the famed Accademia Chigiana, since 1985. "... the violin remains isolated within the orchestral hostilities, making for a vivid and chilling first movement, and Belkin's warm, elegant tone was beautiful and moving... The third movement is a searingly tragic set of variations that is one of the greatest and most intense moments in all music, and Belkin and Nowak shaped this expertly, leading to the violin's unaccompanied cadenza, surely the longest and most demanding in all violin literature. It exploded into the frantic dance finale. Many in the Winspear audience seemed unsure of what they had experienced - it's not a work you "enjoy" - but they knew they'd heard a great violinist, and Belkin received a standing ovation." "... Russian-born violinist Boris Belkin, who is rarely given a chance to rest in the piece (Shostakovich VC1), plumbed its depths and contrasts with a firm, resolute hand, yet one which sought out whatever beauty could be had. This is a demanding work, for both soloist and audience. Belkin did his part - the emotional pull and tug was transfixing... The audience, too, knew a great performance of this dark piece, with many standing at the end." "... Russian born Boris Belkin started making waves in the West in the early 1970s; this week marks the violinist's overdue debut with the BSO. A sensitive, straight forward player, Belkin burrowed deeply into the Prokofiev concerto, releasing the pensive character of the first movement, the sweetness of the second, the sauciness of the finale. His tone was strong and pure, his technique secure. Temirakanov ensured seamless support for the soloist." "...Centrepiece of the programme... was an incredibly dangerous interpretation of Brahms's Violin Concerto, in which both Weller and soloist Boris Belkin appeared to conspire to dump the conventional strategies of classical structure and dramatic momentum in favour of a lingeringly rhapsodic view of the music. Amazingly, though the music hovered languorously and lethally around stalling speed, it never fell out of the sky. In lesser hands it would have succumbed to gravity. Here, it was gripping, if hair-raising." "... Boris Belkin, in his Symphony debut, gave the concerto a crisp, soulful reading..."
"Boris Belkin was the rhetorical soloist in Paganini's extremely complicated Concerto No 1 for Violin and Orchestra. This work demands technical dexterity from the soloist and Belkin is one of a handful of violinists who can make it look and sound less difficult than it is... Belkin is Russian by birth but his body language and personality are like those of a sophisticated Italian entrepreneur. How can one look so relaxed when one is so busy? Apart from the stunning technique there were some beautifully executed phrases in this performance." "...In dem russischen Geiger Boris Belkin hatte Stern einen idealen Interpreten fur dieses schwierige Werk gefunden. Belkin gestaltete den riesigen Monolog in vier Satzen mit schonem, weichem Bogenstrich, in dem vielfaltigste Gefuhlsnuancen mit schwangen. Die weitgespannten Steigerungen bewaltigte er mit nie ermudender Energie..."
"...I remember when violinist Boris Belkin appeared with the band, many years ago, in the City Hall. He was a lean, mean, fighting machine of a musician, who, with his long dark hair and swarthy looks, resembled something more dangerous than a fiddler. Age may have mellowed somewhat his physical appearance, but, by God, he remains a razor-sharp player. If he had played the first two movements of Tchaikovsky's Violin Concerto, it would have been good enough, but - pardon my French - bloody hell, have you ever heard anything like that finale? The fastest on record? The most unbelievably articulate? Have you heard before such control at that speed? It was explosive and electrifying from start to close - the bow must have been red hot, and how the poor wee box of wood, glue, and strings didn't disintegrate in surrender is beyond me. Unforgettable..."
"It is a miracle that Boris Belkin's performance of Tchaikovsky's Violin Concerto with the RSNO on Saturday got to the end in one piece. Not only was it probably one of the fastest on record - possibly by as much as five minutes - but laden with extremes of tempo and mood, the finale took on an intriguing and devilish character, a sense of Sturm und Drang you wouldn't normally associate with the work. ...The glimpse of fretfulness which Belkin introduced right from the start was, in retrospect, a hint of what was coming. In the first two movements, his ravishing portrayal of Tchaikovsky's succulent melodies, his grip on the ferocious technical demands, all fooled us by their composure and refinement. Underpinning all this was a simmering turbulence which erupted, inevitably but unexpectedly and with enormous force, in the finale to provide one of the most thrilling, cathartic and knife-edged endings I can recall..."
"...Playing the (Sibelius) Concerto with the RSNO on Thursday the Russian Violinist Boris Belkin showed that he was capable of coping with the cruellest technical challenges. But that wasn't what stuck in the memory. In Belkin's hands the first movement was spacious and melancholic, the meditative sadness interrupted, but not ultimately disturbed by passing orchestral storms. The slow movement was tender, almost confessional... Belkin summoned exactly the right colour for each phrase; and he has the kind of pianissimo that fills big spaces, like an actor whose whisper is audible from the back of the theatre gallery." "...The audience of the first half then came across the enjoyment of a racy solo performance, by the Russian Violinist, Boris Belkin, who in Alexander Glazunov's first violin concerto produced an effective and elated dialogue with the Deutschen Symphonikern. A top class Virtuoso..."
"...Soloist Boris Belkin puts energy and unbelievable intensity into his playing. He seems very tense - like a sprinter before the starting shot. But he can also play with feeling and tenderness... He mastered the staccato-effect in the final rondo with bravura..."
"Boris Belkin managed to provoke a total silence in the audience as if it was listening to a symphony by Bruckner. Belkin showed with a sparkling technique and never sentimental sound how to save this significant early work. It couldn't have been better." "... with a blameless technique he played with his astounding range of expression. He puts a passionate allegro next to an intensely romantic sound and rapid prestissimo virtuosity in the finale. The orchestra played with the kind of attentiveness which is heightened by such a soloist." "... Belkin's technique was faultless and the performance stylish..."
"... After an energetic start, the mesmerizing slow movement of the violin concerto was the highlight, accompanied by the captivating warmth of the strings..."
"...he has matured in tone and interpretation... this Brahms Concerto was warm, strongly articulated, positively projected and impressive in its command of style. He still cuts a fine figure on the platform, maintaining an air of aristocratic concentration which is reflected in his playing. He has already recorded, among other things, the Bruch and Sibelius concertos with the RPO under Junichi Hirokami - the same forces that accompanied him adeptly in this concert - and the union is obviously a happy and fruitful one." 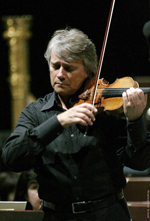 "... Boris Belkin was the soloist in Glazunov's Violin Concerto. He gave a virtuoso performance that made light of the technical demands of the work including more passages of extended double-stopping than I have heard in any other concerto - and always bang in tune." ".. Joined by the great Russian violinist Boris Belkin for the Glazunov Violin Concerto Hirokami held the orchestra like a shimmering safety net. Belkin's tremendous performances were rewarded with an uproar of applause..."
"... Boris Belkin proved a sympathetic interpreter, switching from pensive discourse into sunny melodiousness at no more than a quaver's notice..."
".. Belkin played with sure technical command thereafter, maintaining a beautiful and musical sound while still riding comfortably above the surges of the sound that Ashkenazy was coaxing from the orchestra. His pitch was secure, his sense of nuances accurate as he inflected the concerto's phrasing to give it life and shape. In the slow movement especially his musicality was evident. There was power aplenty for the big lyric statements, yet also delicacy for the little questioning scale figures above the soft pulses of the orchestral strings.... Much of the violin solo writing might be the work of some Northern Paganini, and Belkin did not neglect this aspect of the work, tossing of scales, double and triple stops and other violinistic feats with coolness and accuracy..."
"Boris Belkin and Michel Dalberto do him (Brahms) proud here, striking a finely judged balance between rhetoric and lyricism from the very opening of the First Sonata, and subordinating their considerable instrumental prowess to the music at all times. These are deeply-thought readings which leave little (perhaps too little?) to chance. The players are closely attuned to one another at every level, achieving a sense of harmony well beyond the strictly musical. The conversation is continuous, enlightened and impeccably responsive, the rhythmic contours beautifully supple, never threatened (as so many otherwise excellent performances are) by excessive metrication. The instrumental balances are as well judged by the recording team as by the performers themselves. There may be more unbuttoned versions of these works, but none more civilised or incisive." "...There are few violinists alive today who could negotiate the Sibelius's notoriously wrist-breaking terrain with such continuously breathtaking sweetness of tone and left-hand infallibility. The Bruch G minor Concerto is also played with a chasteness and purity of utterance that will affect even the most resistant of tear ducts. There is not one ugly sound; Belkin's characteristicaly silver sound is hoisted aloft via bowing of an almost Milsteinian elegance...."
"...It has become a bit quieter around Boris Belkin in the last years. However, he has not lost any of his creative profile - on the contrary. Belkin convinces with his rather plain but also sensitive style of playing. With a clear, slim sound he intones Glasunov's atmospheric lyricism as he does the motorially heated passages of the Shostakovich concerto." "...he gives a forthright performance of the Sinfonia Concertante, refreshingly free from mannerism: the orchestral exposition to the initial Allegro maestoso sets this tone firmly and the soloists' entry soon after the two-minute mark is un-spotlighted. Indeed, there is much to enjoy here... the playing is never less than distinguished... The Divertimento is a five-movement work... and the playing here, too, is pleasingly vivid..."